China incrementally began to embrace the ever-increasing and omnipresent advent of globalisation. The Deng era, as has been stipulated triggered a trajectory of progress however it is necessary to convey that as greater prosperity took hold, so too did its commitment to geo-politics—eventually, this would not augur well for Taiwan. It can be safely argued that China became a more emboldened actor in the international sphere post-1997—the retrocession of Hong Kong being a major and successful undertaking. This did not however, happen in isolation. To emphasise the point perhaps the most ardent aspect of change that China encountered and which definitively and inexorably changed its outlook toward its ‘place’ in the world and one which impacted on their domestic environment—essentially with the ‘knock-on’ effect alluded to intact—and of globalisation writ large was the 1999 bombing of the Chinese Embassy in Belgrade by the US. Certainly, ‘after the 1999 Chinese embassy bombing incident in Belgrade, [which the was the outcome of US targeting] Jiang Zemin, in certain pronouncements for the domestic audience, transformed the lesson of being humbled by the USA into a call for China’s further economic reform, strengthening China’s economic position in the world, embracing globalisation and catching up with the advanced countries.’ Thus, a single event signalled to China that it needed to completely reassess its role in the A-P region; and the international arena. Whilst it can also be argued the CCP’s newfound attitude was spurred on at this time by its success in the retrocession of Hong Kong, the consequence of the happening moved its determination to be regional- and global-actor to an elevated level. Within the formulaic of power-stakes there resides a greater understanding and reasoning of the PRC’s intent, and this will be dealt with later in this thesis. To wit, the problem for Taiwan is that China from this point on, China would begin to benefit from the phenomenon of globalisation and it would prompt the CCP through the aforementioned doctrines of economic, military, and nationalistic proclivities to intensify its irredentist demands; and stimulate its politico-intensity in general. Taiwan’s retrocession would now become a core component of the CCP’s demands. In addition to and emphasising the fundamental issue associated with the political repercussions of globalisation, the rapid unravelling of the Soviet Union at the end of the Cold War the (new) Russian Federation resulted in Taiwan having its previous status of pseudo-independence being rescinded in 1992. The dyad of the rapidity of change combined with the Russian Federation completely embracing sovereignty even though it was still in a state of flux. The accepted sovereign statehood of China and its claims on Taiwan remained applicable and as globalisation took hold in a much more substantial and cognisant way and as a happening proved deeply troubling for Taiwan—and moreover both Cold War superpowers had withdrawn support. Globalisation and its repercussions would show that major actors would exert policies that were ever-more rigid in their politico and strategic-influences and as a result Taiwan and China would increase their attempts at influence. To be sure, both Taiwan and China have sought to extend their influence through numerous aspects of globalisation. China it is fair to argue had managed to spread at an exponential level from the early twenty-first century. Nonetheless, Taiwan too sought to maintain its influence through the redundancy of independent politico-imagery and its associated dialogue. There has been and continues to be, within the power-paradigm that globalisation demands a triad of ways in which to exert influence. The triad consists of ‘soft power,’ economic (through utilitarian aid programmes), education, cultural and passive political support; ‘hard power’ which consists of a deliberately focused military and the concomitant economic ties, which often entail an agreement of protection or direct support; and ‘sharp power’ which extends to military ties (such as a host country allowing a military base to be built and operated by a foreign actor) and the subsequent economic ties that enable the power projection to be carried out—road-, port-access and overfly rights is to name only several. As part of the globalisation matrix, the types of power in order to extend influence may merge and overlap, although all have the propensity (and do) facilitate and improve preponderance capabilities. 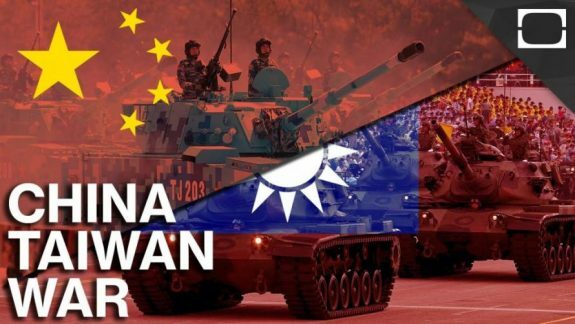 Taiwan has been able to access both soft and hard power, while China has been able to access all three. Within the structure of confirming or striving for superiority the elements of control alluded to are diminished if all three are not able to be accessed. What is of interest here is the application of sharp power. The extent of sharp power comprises but is not limited to the enlargement of patrolling range through littoral or ocean-going/blue water assets; improving territorial access through infrastructure; continuing to establish zones-of-control; the availability of deterrent or blockading mechanisms; utilising threat-of-force through standoff actions; extend littoral zones through static territorial, air, and nautical placements; an increased ability to protect the homeland’s domestic environment through force dispersion; asset utilisation to test responses of other allied and non-allied actors; and where necessary apply direct kinetic applications—no-fly-zones and (the option for) invasion. China is particularly adept at sharp power—as have previous imperial powers such as Britain, France, Russia and the US have been. The ongoing issue for Taiwan and its independence and it is fair to argue, is a problem made worse by the increasing globalisation of the world. Due to the domestic, regional, international and cosmopolitan perspectives that have been summed up (albeit briefly), the relevant cross-Strait machinations—including the retrocession components of China’s ascendant irredentist attitudes and the ubiquitous independence stance and position of Taiwan, there is a need to observe the fulcrum of other issues. What can now be addressed is the geo-strategic, geo-political avenues that must be encountered and navigated through will comprise, though not be limited to the following: the necessary relevant chronological (historical) perspectives; present influencing factors, near-future outcomes; and forecasting. With this in mind and for the sake of clarity it must be assumed the CCP will be astute in its control of China and that its tenure as a ruling power will remain steadfast. From the perspective of Taiwan however, it must also be stated up front that it is a liberal-democracy and it must be acknowledged that like every democracy it is prone to the vagaries and impulses of voting blocs per se. China does not have this problem and to give this context, whilst there are voting blocs within the NPC, which affects policy outcomes and polity overall, it is a moot point and need not be entered into here, as it is these stark political difference that only needs mentioning. In conclusion to the above structural underpinnings, the governments of both countries are aware of, and deal with numerous politico and strategic elements external to their domestic environments demanding issues of cross-Strait relations and the associated regional and political machinations. And whilst it may be the case that liberal democracies are definitively beholden to the vagaries of specific voting-blocs in the public sphere-of-influence—a point which will be drawn upon later in this thesis—Taiwan and China are nonetheless, committed to diplomatic suasion and the building of favourable polity to progress their specific needs; and advantage. To wit, the aforementioned falls in the realm of gaining politico and military-advantage regionally, internationally and indubitably, in competition to dominate cross-Strait relations. However, this has not always been the case and in order to balance the current state-of-affairs it is appropriate to reflect on less-confrontational times and observe there has existed more harmonious elements. William Callahan Contingent States: Greater China and Transnational Relations. Minnesota: Minnesota University Press, 2004, 52. Italics mine. According to Gochman brinkmanship becomes part of political manoeuvrings when, ‘decision makers perceive a dramatic impending shift in the balance of power in favour of an adversary and/or a substantial internal challenge to their own political position at home.’ See: The Process Of War. Advancing the Scientific Study of War. Edited by Stuart Bremer and Thomas Cusack. Australia: Gordon and Breach, 1995, 97. There are common features in what Calhoun describes as the ‘rhetoric of nations’ and though they do not completely define what a nation comprises they include but are not limited to, boundaries of territory, indivisibility, sovereignty, legitimacy, participation in collective affairs, direct membership, culture, temporal depth, common characteristics and special histories. See: Craig Calhoun. Nationalism. Buckingham: Open University Press, 1997, 4-5. ‘[S]oft power’ ‘arises from the attractiveness of a country’s values, political ideals, and policies. See: Joseph Nye. ‘Soft Power and European-American Economic Affairs.’ Hard Power, Soft Power and the Future of Transatlantic Relations. Edited by Thomas Ilgen. Aldershot: Ashgate Publishing Limited, 2006, 26. ‘Hard power’ centres on military and economic power … .’ Hard Power, Soft Power and the Future of Transatlantic Relations, 26. This concept of voting-blocs and the way in which a war encourages them is expanded upon in the heading under ‘Taiwan and the realities of a war with China’: A brief deliberation,’ 59. According to a fellow MOFA (2018) recipient and PhD candidate Gustavo Henrique Feddersen, voting-blocs within the NPC are able to be traced when applying an astute application to the way in which the CCP conducts its political acumen. Feddersen suggests and based on our discussions, there is much debate that continues in the private realm of the CCP and influence can be traced to provinces that a particular CCP member will be known to support and policies or policy input will reflect that influence. Regard for internal CCP informal coalitions, based on patron-protégé relations and upholding specific policy orientations, also contributes when inferring the origins and support for certain initiatives. Upon policy declaration being made however, all NPC members support the policy presented, which unlike in liberal-democracies there is much post-policy debate that happens. This does not accord with CCP principle and therefore, does not take place. This practice relates to the combination of Leninist “democratic centralism” and post-Deng era “collective leadership”. See: Cheng Li, Chinese Politics in the Xi Jinping Era: Reassessing Collective Leadership (Washington: Brookings Institution Press, 2016); David M. Lampton, Following the Leader: Ruling China, from Deng Xiaoping to Xi Jinping (University of California Press, 2014); Joseph Fewsmith, The Logic and Limits of Political Reform in China (Cambridge University Press, 2013); Tony Saich, Governance and Politics of China, 3rd ed. (Hampshire, UK: Palgrave Macmillan, 2011); and David Shambaugh, China’s Communist Party: Atrophy and Adaptation (University of California Press, 2008). Strobe Driver completed his PhD in war studies in 2011 and since then has written extensively on war, terrorism, Asia-Pacific security, the ‘rise of China,’ and issues within Australian domestic politics. Strobe is a recipient of Taiwan Fellowship 2018, MOFA, Taiwan, ROC, and is an adjunct researcher at Federation University.